It’s no secret that I want bunnies. 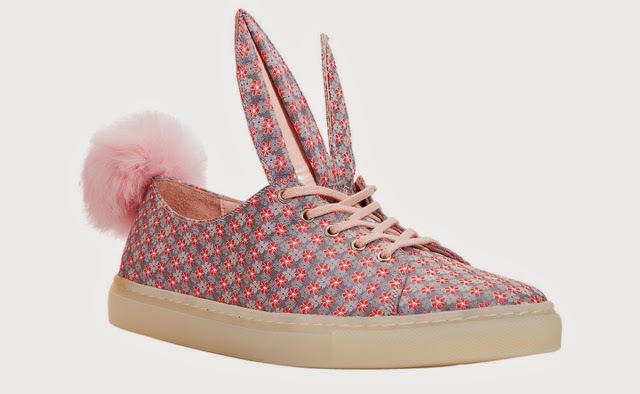 I am so obsessed at the moment that anything that looks vaguely like a bunny, I’m all over, which includes these badass sneakers. Minna Parikka is my new found hero. She went into shoe design as unlike clothes, shoes don’t need to be inhabited by a body to make them look beautiful. Take these Tail Sneakers for example, just look at how wonderful they look all by themselves. The cute floral print, the pink laces, the pointy ears complete with pink lining, and let’s not overlook the cute pom pom tail. Now imagine how good they’d look with my feet in. All for €260. I want them so badly. But even more, I want to meet Minna and tell her that her shoes rock my world and that she’s my new shoe hero.